Above: The Apostolic Bible Polyglot hardback. HARDBACK: The Apostolic Bible Polyglot Hardback Alpha Version has the same quality pages as the Eco-cowhide & leather Bibles. The Bible measures 7.5 inches wide and 9 inches long and 1.75 inches thick. The paper is 19.5 lb. white Bible paper, 1560 PPI, from the Tervakoski Mills in Finland, and printed in the United States of America. The book is flush cut with a glued (perfect) binding. The spine has gold-foil lettering.The Apostolic Bible hardback comes with a vinyl envelope which contains a name tag and hand out literature with directions on the free downloads of The Apostolic Bible Polyglot that you can give to your friends or anyone who asks you about your Bible...this way you will actually be giving them a free Bible. The Apostolic Bible Polylgot does NOT include the Deuterocanonicals (apocrypha). Above: The Apostolic Bible Polyglot Eco-cowhide in saddle. ECO-COWHIDE SADDLE: The Apostolic Bible Polyglot Eco-cowhide Alpha Version has the same quality pages as the hardback & leather Bibles. The Bible measures 7.5 inches wide and 9 inches long and 1.75 inches thick. The paper is 19.5 lb. white Bible paper at 1560 PPI, from the Tervakoski Mills in Finland, and printed in the United States of America. This is a glued binding and the cover is perimeter stitched with the spine having a gold foil stamping along with gilded edges with rounded corners. Inside of the Eco-cowide Bible is two bookmark ribbons of gold and bronze, one color for each testament. The Apostolic Bible Eco-cowhide Bible comes with a vinyl envelope which contains a name tag and hand out literature with directions on the free downloads of The Apostolic Bible Polyglot that you can give to your friends or anyone who asks you about your Bible...this way you will actually be giving them a free Bible; also included is a 1.75" x 4" papyrus bookmark. The eco-cowhide edition is enclosed in a beautiful avocado green canvas duck bag with a wax seal and elastic cord. The Apostolic Bible Polylgot does NOT include the Deuterocanonicals (apocrypha). Above: The Apostolic Bible Polyglot Eco-cowhide in ebony-brown. ECO-COWHIDE EBONY-BROWN: The Apostolic Bible Polyglot Eco-cowhide Alpha Version has the same quality pages as the hardback & leather Bibles. The Bible measures 7.5 inches wide and 9 inches long and 1.75 inches thick. The paper is 19.5 lb. white Bible paper at 1560 PPI, from the Tervakoski Mills in Finland, and printed in the United States of America. This is a glued binding and the cover is perimeter stitched with the spine having a gold foil stamping along with gilded edges with rounded corners. Inside of the Eco-cowide Bible is two bookmark ribbons of gold and bronze, one color for each testament. The Apostolic Bible Eco-cowhide Bible comes with a vinyl envelope which contains a name tag and hand out literature with directions on the free downloads of The Apostolic Bible Polyglot that you can give to your friends or anyone who asks you about your Bible...this way you will actually be giving them a free Bible; also included is a 1.75" x 4" papyrus bookmark. The eco-cowhide edition is enclosed in a beautiful natural canvas duck bag with a wax seal and elastic cord. The Apostolic Bible Polylgot does NOT include the Deuterocanonicals (apocrypha). Above: The Apostolic Bible Polyglot Cowhide Alpha Version. TOP GRAIN GENUINE COWHIDE LEATHER: The Apostolic Bible Polyglot Cowhide Leather Alpha Version has the same quality pages as the hardback & eco-cowhide Bibles. The Bible measures 7.5 inches wide and 9 inches long and 1.75 inches thick. The paper is 19.5 lb. white Bible paper at 1560 PPI, from the Tervakoski Mills in Finland, and printed in the United States of America. This is a glued binding and the cowhide leather cover has gold foil stamping on the spine along with gilded edges and rounded corners. Inside of the Cowide Leather Alpha Version Bible are two bookmark ribbons of black and silver, one color for each Testament, and heavy duty Bible end sheets. The cowhide Bible comes with a vinyl envelope which contains a name tag and hand out literature with directions on the free downloads of The Apostolic Bible Polyglot that you can give to your friends or anyone who asks you about your Bible...this way you will actually be giving them a free Bible; also included is a 1.75" x 4" papyrus bookmark. The cowhide edition is enclosed in a beautiful canvas duck bag with a wax seal and elastic cord. The Apostolic Bible Polylgot does NOT include the Deuterocanonicals (apocrypha). Above: The Analytical Lexicon of The Apostolic Bible Polyglot. ANALYTICAL LEXICON: The Analytical Lexicon of The Apostolic Bible Polyglot is a 426 page book listing every spelling of every Greek word which appears in the Greek Old (LXX) and New Testament texts, except for proper names. The Analytical Lexicon lists by AB-Strong’s number, and then alphabetically, with every particular spelling of the Greek word following. The first line of a structure begins with the part of speech of the Greek word...i.e. noun, adjective, verb, preposition, pronoun, participle, etc. On the same line to the right of the dots is the AB-Strong number. The first Greek word on the following line is the dictionary word, or lemma with the English word or words that appear in the Apostolic Bible after the dots. Corresponding to The Analytical Lexicon of the Apostolic Bible Polyglot is the The Grammar of The Analytical Lexicon of The Apostolic Bible Polyglot which is described on its own link. Above: Entities of the Book of Revelation. ENTITIES OF THE BOOK OF REVELATION: is a 200 page book containing over 500 entities from the Book of Revelation. Each Entity is listed in columnar order with the Entity word at the top, followed by the Greek equivalent word and the AB-Strong's number which can be used to correlate your studies with the English-Greek Index, the Lexical Concordance and the Analytical Lexicon of The Apostolic Bible Polyglot. Below the heading is listed each occurance of the Entity word in the Book of Revelation and in the Septuagint of The Apostolic Bible Polyglot. The structures end with Editor's Notes from the translator of The Apostolic Bible Polyglot who has thirty years plus experience translating the Greek scriptures. 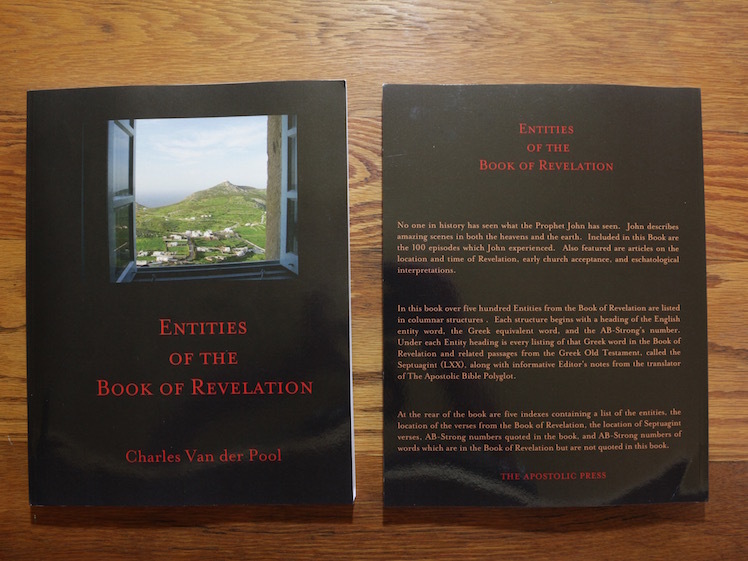 At the rear of the book are 5 indexes containing a list of the Entities, locations of verses quoted from the Book of Revelation and of the Septuagint quotations, along with indexes of AB-Strong's numbers used in the book. Above: English Derivatives from the Greek New Testament. ENGLISH DERIVATIVES FROM THE GREEK NEW TESTAMENT: This book was written by Charles Van der Pool the translator of The Apostolic Bible. The word “derive” means, “To have as a source.” The source or root of many English words are Greek words, and English derivatives retain a resemblance of the original Greek word in pronunciiation and spelling. For example, the word “philosophy” is derived from two Greek words, transliterated as “philos” and “sophia.” The word “philos” means “friend” and “sophia” means “wisdom,” and combined they mean “friend of wisdom.” Therefore the word “philosophy” is an English derivative from the Greek language. THE CD-ROM CONTAINS TWO BIBLES: The Apostolic Bible Polyglot is one Bible and the 1709 Lambert Bos LXX is the other. The Apostolic Bible Polyglot contains the text of both New & Old Testaments, the Lexical Concordance of the Apostolic Bible Polyglot, the English-Greek Index of The Apostolic Bible Polyglot, and the Analytical Lexicon of The Apostolic Bible Polyglot. The 1709 Lambert Bos LXX is in a scanned format, i.e. a tiff picture rendered into pdf. It is unsearchable except for going to pages. 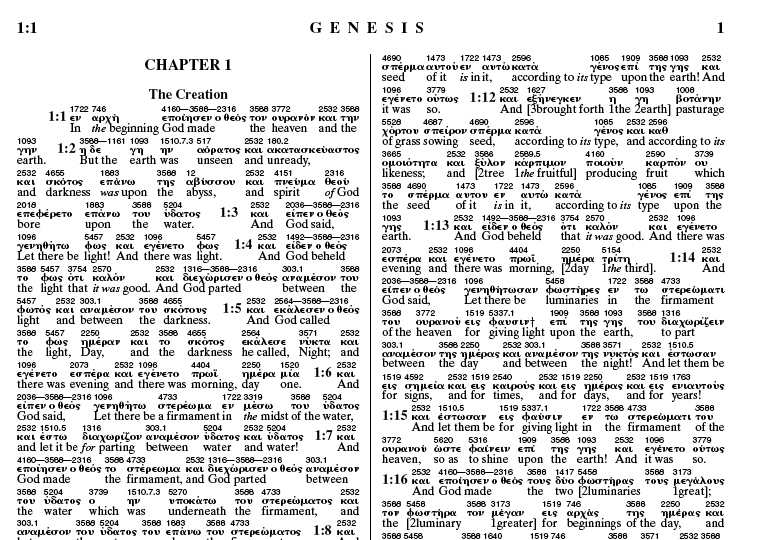 The AB-Bos CD ROM contains the same 66 Books of the Bible as found in The printed edition of The Apostolic Bible Polyglot. Neither The Apostolic Bible Polylgot nor the AB-Bos CD-ROM includes the Deuterocanonicals (apocrypha). Above: These are the papyrus and parchment bookmarks. BOOKMARKS: In-depth information on the bookmarks may be found on the bookmarks page.